Greenstreet became the name for the part of the ancient Roman road (Watling Street), now the A2, which forms the southern boundary of the parish, presumably because after its intensive use and regular maintenance in Roman times its metalling was neglected in Anglo-Saxon and medieval times to the extent that it became literally green, with moss and grass. The name is first recorded in 1278. 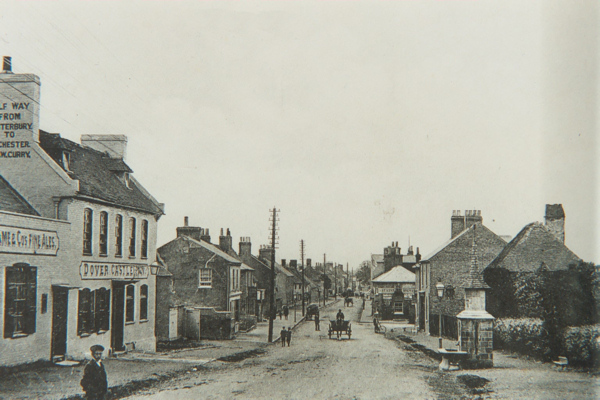 Since the premises on the south side of the road were in Lynsted parish and those on the north in Teynham, as they still are, the substantial settlement which developed alongside it became known as Greenstreet. Greenstreet c 1910 So it remained till the early 20th century, and early picture postcards of it, like the one reproduced here, bear this name. Both its post office and Methodist chapel also used this name. There are no other settlements called Greenstreet in the UK, but in the later 20th century this did not deter this stretch of road being given the prosaic name it now bears - London Road - which of course is repeated countless times within a 100-mile radius of London. Road signs at the A2 entrances to the settlement read 'Teynham', though they should really read either 'Lynsted & Teynham' or 'Greenstreet'. In fact Teynham Street, the 'village street' of Teynham, lies about a mile to the north. However the settlement's Methodist chapel (also used by local Roman Catholics) still uses the name, and it is also perpetuated in the family name Greenstreeet. This is first recorded in 1494, with the death of John Greenstreet, who lived at Claxfield, at the far west end of Greenstreet, in the parish of Lynsted. The name became well-established locally to the extent that in the Faversham area and indeed in East Kent generally it became almost as common as Smith and far more common than Robinson. For many people, particularly fans of "Casablanca" and other films of the 1940s and 1950s, the best-known bearer of the name is Sydney Greenstreet, born the son of a Sandwich tanner in 1879. Seldom a lead player, and usually cast in sinister supporting roles, he was an inveterate scene-stealer whose name on a cinema poster was a recommendation in itself.